February 11, 2016 By This post may contain affiliate links. 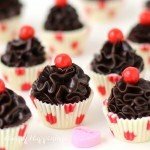 Cute little Chocolate Truffle Cupcakes make sweet Valentine’s Day treats. Each bite size white chocolate cup decorated with red polka dots is filled with a swirl of dark chocolate ganache and topped with a candy coated chocolate. 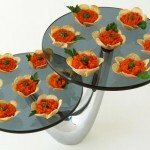 With Valentine’s Day fast approaching, I decided I better get some sweet treats made for my husband. He loves my dark chocolate truffles and I knew he would have been happy if I’d just have scooped the chocolate ganache, rolled it into balls, the coated them in shaved chocolate, but I had a better idea. Well, actually, I had seen a better idea, and thought I’d make something similar. Fellow blogger, Brooke Larke, of Cheeky Kitchen, decorated the tops of her Tres Leches Red Velvet Cupcakes, for Tablespoon.com, with the most adorable little chocolate truffles that also looked like cupcakes. 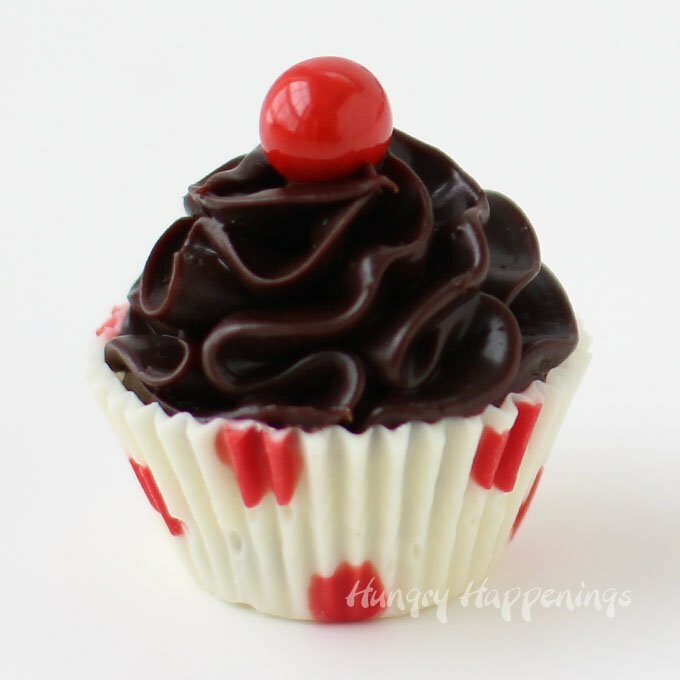 Brooke was able to find the mini chocolate truffle cupcake toppers at her grocery store. I decided to make my own. 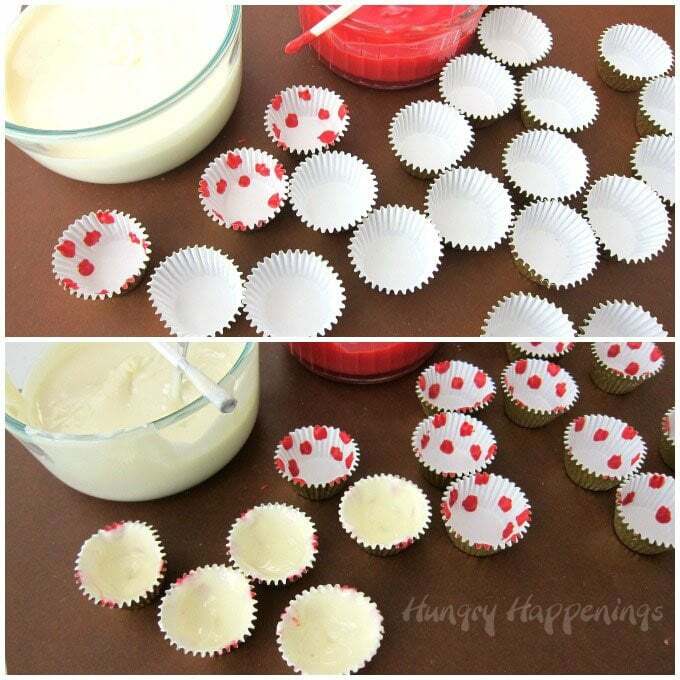 Similar to the store bought candies, I chose to decorate the edible cupcake cups with polka dots. It’s a simple design, but it really looks great. Being my husband works from home these days, it’s hard to surprise him with anything homemade. 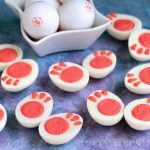 He happened to walk downstairs just as I was snapping shots of these cute Valentine’s Day treats, and made an, oh, so subtle, comment about how tempted he was to steal one of the candies. I just had to give him one to try. I stood and watched him try to peel the paper away from the truffle, only there was no paper. He thought the polka dot cup was paper. I couldn’t help but giggle. He made me promise I’d tell you that you should mention this to your loved ones so that they don’t get laughed at too. I guess that’s not very romantic, but neither is my husband, so I didn’t feel too bad. 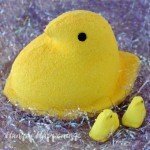 I was surprised to hear him say, “these are really cute.” My husband also doesn’t use the word cute very often, unless he’s talking about our dog, who’s name happens to be Truffle. Now she’s a cute truffle. He also told me how much he loved the contrast of the crisp white chocolate shell to the luscious dark chocolate ganache. O.K., he didn’t use those exact words, but having spent countless hours with me, talking about every detail of our meals, he’s become a bit more poetic when describing food. 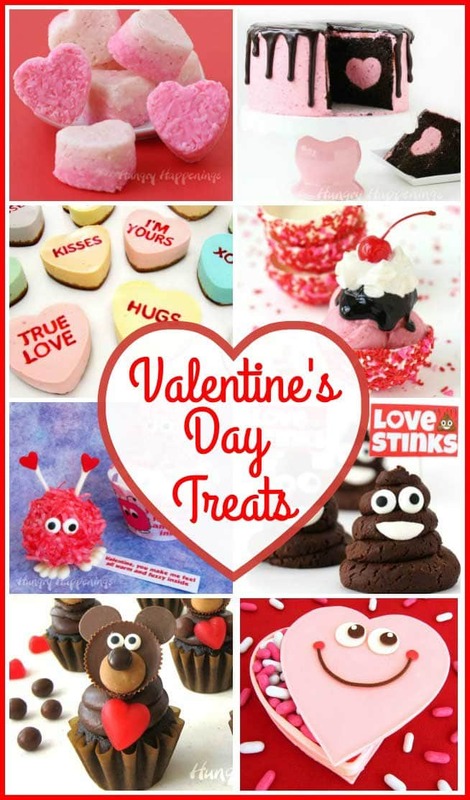 I was thrilled with his reaction and am excited to share this recipe with you so you can make some for your sweetie this Valentine’s Day. Start by making dark chocolate ganache. I like to make mine using a food processor. It makes this process quick and easy and I get wonderfully smooth ganache. Start by placing chopped chocolate in the bowl and pulsing it to fine crumbs. Being the ganache wasn’t going to be covered in chocolate, I wanted it to be really glossy, so I added some corn syrup to the heavy whipping cream then heated that just until hot. You can do this in the microwave for about a minute, or in a saucepan set over medium heat. Either way you heat it, you want it to just begin to bubble, not actually boil. Pour the hot cream over the chocolate, put the lid on the food processor bowl, and let sit for 2-3 minutes. Pulse for 5 seconds. Remove the lid and scrape down the sides and bottom of the food processor bowl. Return the lid and pulse for 5 more seconds or until the mixture is smooth. Don’t over-mix your ganache or it will turn grainy as it sets up. If you don’t have a food processor, finely chop your chocolate and put it in a microwave safe mixing bowl. Heat the cream and corn syrup and pour over chocolate. Let sit for 2-3 minutes. Use a whisk or spatula to create an emulsion. Begin by stirring just in the center of the bowl, then slowly bring the whisk out to the edge of the bowl. Stir just until combined and the ganache is smooth. If you have chunks of chocolate remaining, place entire bowl in microwave and heat on high for 10 seconds. Stir until melted. Place a piece of plastic wrap over the surface of the chocolate ganache and set it aside for about an hour. You want the ganache to thicken just enough so that you can pipe it. Too thick and you won’t be able to pipe it. So, keep an eye on it. 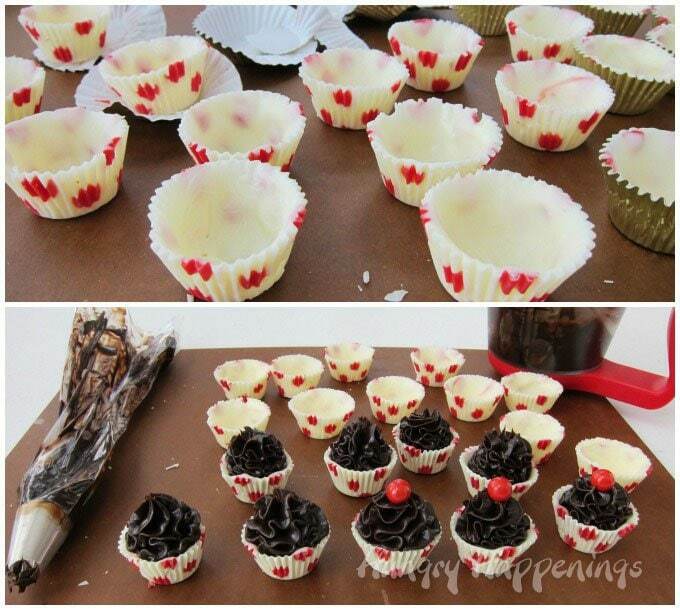 To make the edible chocolate cups, you can use melted and tempered white chocolate or melted white confectionery coating (candy melts, almond bark, candy coating.) 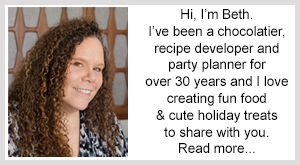 You can find detailed information regarding choosing the right chocolate and melting it on my Chocolate Making Tips page. Color some of it using red candy coloring, then use a food use only paint brush to paint red polka dots on the inside of some small paper candy cups. Pop them in the refrigerator, if using pure chocolate, or freezer, if using candy melts, for a few minutes to allow the candy to harden. Remove, then paint the bottom and sides of the cup using white chocolate. Chill until hardened, about 5 minutes. I used foil candy cups because they are more sturdy. If you use plain paper cups, you might want to keep two cups together to make them more sturdy. Candy cups come in several different sizes. I used 1 inch, measured across the bottom of the cup. 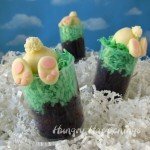 If you use mini cupcake cups, which are between 1 1/4 and 1 1/2 inches, your candies will be larger and you’ll make fewer candies using the ingredients listed in the recipe. 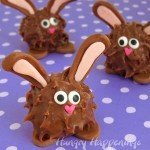 You can also do this using a candy mold, if you have one on hand. Remove the candy cups from the refrigerator and peel or tear the paper cups off. Pipe a big swirl of chocolate ganache into each chocolate cup and immediately top with a round candy coated chocolate or sprinkles, if you prefer. If you are in a hurry, you can refrigerate the ganache, for 10 minute increments, stirring after each until thickened. Do not forget about it though, because once it becomes too firm, you will not be able to pipe it into a swirl in your chocolate cups. The chocolate ganache will firm up even more, but should maintain it’s pretty glossy appearance. Store the candies in an airtight container for up to 2 weeks. If you refrigerate them, be sure to remove the container and set it on the counter, un-opened for at least an hour, while the candy comes to room temperature to avoid getting condensation on the candies. 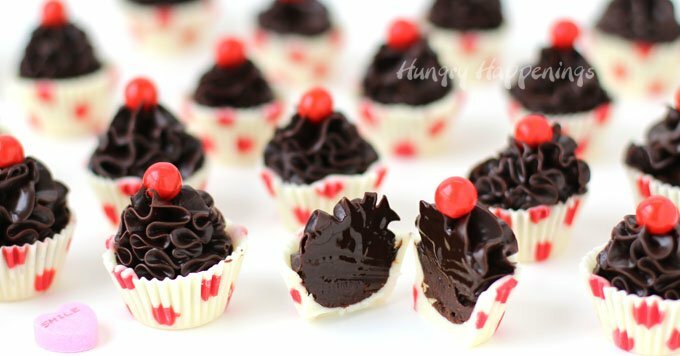 Little white chocolate cups decorated with red polka dots are filled with dark chocolate ganache and topped with a candy coated chocolate. *If you use confectionery coating you could use 8 ounces of white and 2 ounces of red. Combine heavy whipping cream and corn syrup in a microwave safe bowl. Heat for 1 minute then stir. Pour chopped chocolate into the bowl of a food processor or in a mixing bowl and pour hot cream over top. Allow to sit for 3 minutes, then pulse or stir until smooth. Let cool for one hour until thickened. Color 2 ounces of white chocolate or confectionery coating using red candy coloring. Use a food use only paint brush to paint polka dots on the inside of 24 paper candy cups. Refrigerate for 5 minutes until the dots are hardened. Spoon about 1/2 teaspoon of white chocolate into a cup and brush it up around the sides of the cup. 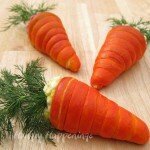 Refrigerate for 5-8 minutes until hardened. Freeze if using confectionery coating. Peel the paper off the white chocolate cups. Pour thickened chocolate ganache into a pastry bag fitted with a large star tip. Pipe a big swirl of ganache into each candy cup. Immediately top with a chocolate coated candy ball. Oh my god. These are amazing! I didn’t realise at first that the cups were made from chocolate too either. I am so impressed right now. These are super cute!! 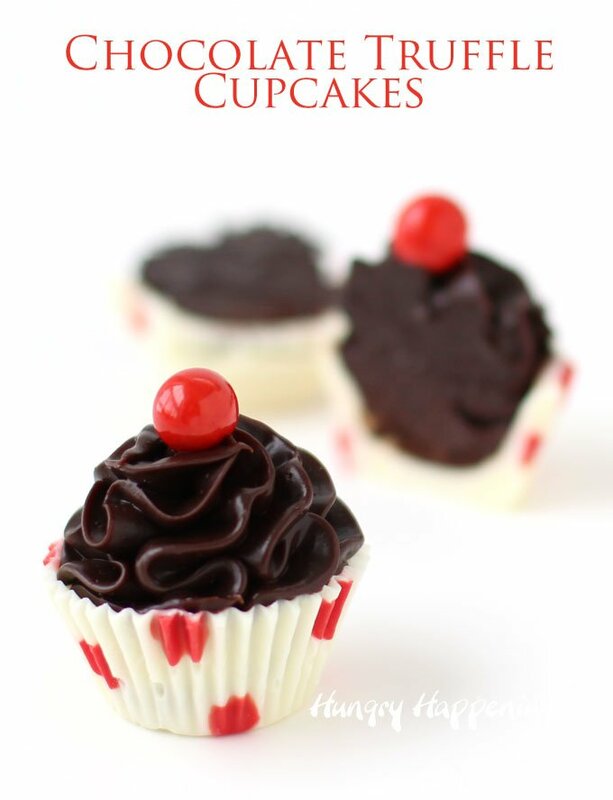 Another yummy idea would be to put a candied/maraschino cherry on top . . .I may have to try these out. Thanks, Lucy. 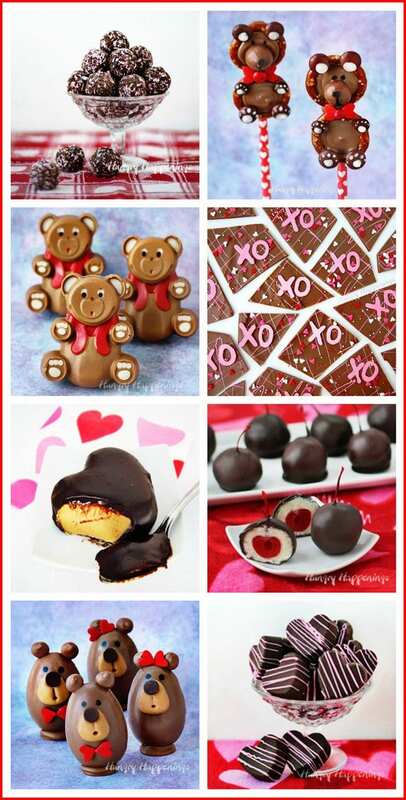 Cherries would taste great, but they will be quite a bit larger than the candies.Have fun making your candies. So adorable Beth, I too thought at first they were paper wrappers, but finding they are edible, makes them so much more fun! Thanks, Kim. My husband is really loving his special treats. What a gorgeous dessert! Pinning!